« Short Buttoned Waffle Scarf – Free One Skein Pattern Included! 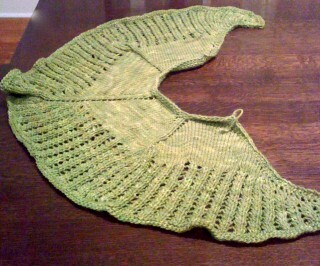 Stephen West’s Colonnade Shawl from Knitty was on my knitting wish list for a while. This fall, I looked for aran weight wool it required at a number of my yarn stops. The Fleece Artist aran weight blue face leicester I bought at Loopy Yarns was a perfect fit and a helpful member of Ravelry confirmed that the yardage was sufficient (375 meters which is a lot for a hank of that weight yarn). Due to the size of the hank, my husband (who I must admit winds most of my yarn) had to play with the yarn to get the entire hank into two connected balls that I could knit. It is possible that I need to add a larger ball winder to my collection of knitting tools. Fortunately, my knitting friend, Amanda, had given me a special yarn holder where I placed the two balls. Itching to start the shawl, I tested a number of different size needles before using 10.5. After knitting with much smaller gauge yarns, the aran weight blue face leicester was a speedy knit. I love this wool and wish that Loopy Yarns where I bought it on sale was nearby so that I could go back and buy more! It is soft and a dream to knit with. Stephen West’s Colonade pattern is easy to follow and has an unusual four panel shape for a shawl. It would be helpful if Knitty included a schematic to help knitters conceptualize the finished piece. Stephen West has incorporated nice details. As designed, the shawl uses two colors of yarn although I made mine from a single color. To-date, there are over 500 versions on Ravelry which classifies it as popular. 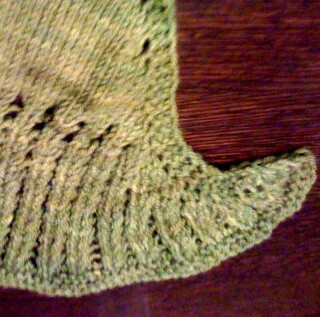 My Moss Green Colonnade was a quick knit. It is made to be worn either wrapped around one’s neck or buttoned on the side. 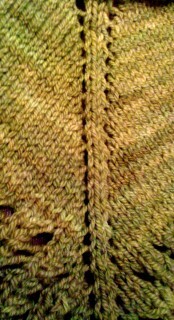 Unfortunately, my shawl wound up with curled hooks at the points. While I probably could have blocked them out, I didn’t like the way that the shawl worked wrapped around. That said, I think that this pattern is good for those readers who want shawl that functions like a poncho. Therefore, I decided to reuse the wool for another project since I like the wool too much to give it away.